A long time ago, when I had the coolest job in the world that involved cutting trail for ATVs on Forest Service land, and also cleaning bathrooms for all the riders that used the trails, I wore Carhartt pants every. single. day. They were the best protective equipment from chain saw exhaust, outhouse backsplash and juniper branches at 45 MPH. Then I married a guy who hated Carhartts. He called me bad names when I wore them and told me only a certain type of girl would dress that way. I acquiesced to his taste and gave them up. Consequently I tore through about 5 pairs of jeans in the last few months of that job, once I quit wearing double-knee cotton duck. But I packed all of my trusty Carhartts away sadly, never to be worn again. They sat collecting dust in a basket until today. See, yesterday I decided to rearrange and clean my room. Turns out that I haven't done this since I have been living alone, and I have found all sorts of amazing things in the process. Like those important EMT papers that we were looking EVERYWHERE for. I guess under the bed is as good a place as any to lose an entire box of manila folders. Stands to reason. Got those safely handed off to more responsible persons, and I came home and launched a mountain of about 51 pairs of Nomex pants and a full basket of Carhartts. I think I forgot how much these pants had become a part of me until I pulled them out. I really had every intention of getting rid of them, and then all of a sudden I couldn't remember why. I put on my favorite pair. They are all customized. 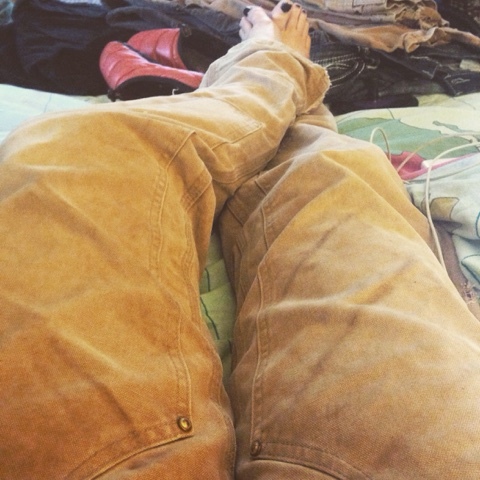 I started from stiff-starched brand new ones and washed them into buttery softness, perfectly worn in. I cut the waistband out so I can fold them over and they don't go up to my armpits. They're like the indestructible version of fold-over yoga pants. I used to roll them up and wear them with flip flops like the baddest-assest pair of capris ever. I can't remember why I quit wearing them. Something about a boy. Putting them on was a flashback to a girl that I used to be. Someone tougher, cooler. Before the last husband, before the Buckle and blingy jeans. Before I decided I needed to try so hard to be something else for somebody else. So much in my life then changed who I was. Living in constant pain and trying to figure out a doomed relationship and raise wild teenagers while I was working full time - there wasn't even room for me in my own life any more. Now I have ample time to fit myself in and I stare and the mirror of introspection and can't figure out what's out of whack. But in my mind I think that surely something must be, or I wouldn't be alone. Maybe it's that I forgot the Carhartts. I forgot who I was. Who I am. And now that the pain is gone, the world has stabilized a little bit, and all of this alone time is just a chance to remember how I got here, and to find that girl in the Carhartts again.